Here are the Printable Versions of the Official PRC LET Reviewers. Feel Free to download the following files below. Taking the LET? 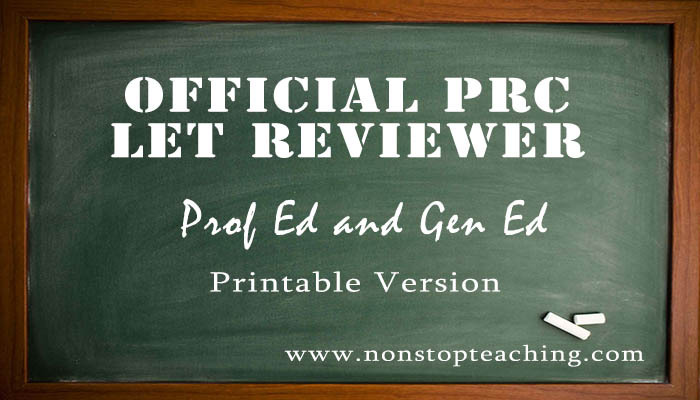 Here are the Official PRC LET Reviewer in Prof Ed and Gen Ed. Printable version in pdf and docx format. Gen Ed: English, Filipino, Mathematics, Science, Social Science, ICT, Prof Ed: Foundations of Education, Child and Adolescent Development, Principles and Theories of Learning and Motivation, Principles and Strategies of Teaching, Curriculum Development, Education Technology, Assessment and Evaluation of Learning, Teaching Profession, Social Dimensions in Education. Free download here. I hope there would be Let Reviewers on Specializations so that the review would be complete. This website is really helpful for both aspiring and professional teachers.